To investigate the subsequent managment and progress of patients presenting with common bile duct (CBD) stones or gallstone pancreatitis who undergo endoscopic retrograde cholangiopancreatogram (ERCP) who have not undergone previous cholecystectomy. To investigate the outcomes for patients who do not undergo cholecystectomy following ERCP. Cases were investigated retrospectively. All patients who underwent ERCP over a one year period in 2004 for gallstone related problems without previous cholecystectomy were included. Endoscopy database and case notes were evaluated. Cases were followed up to the present. 136 patients were evaluated. 82 of 136 went on to cholecystectomy within 2 months of ERCP. The mean age was 62 years (range 36 to 84). 10 cases had on table cholangiogram, one of which proceeded to CBD exploration and the remainder had a clear biliary drainage. 8 cases were converted to an open procedure. 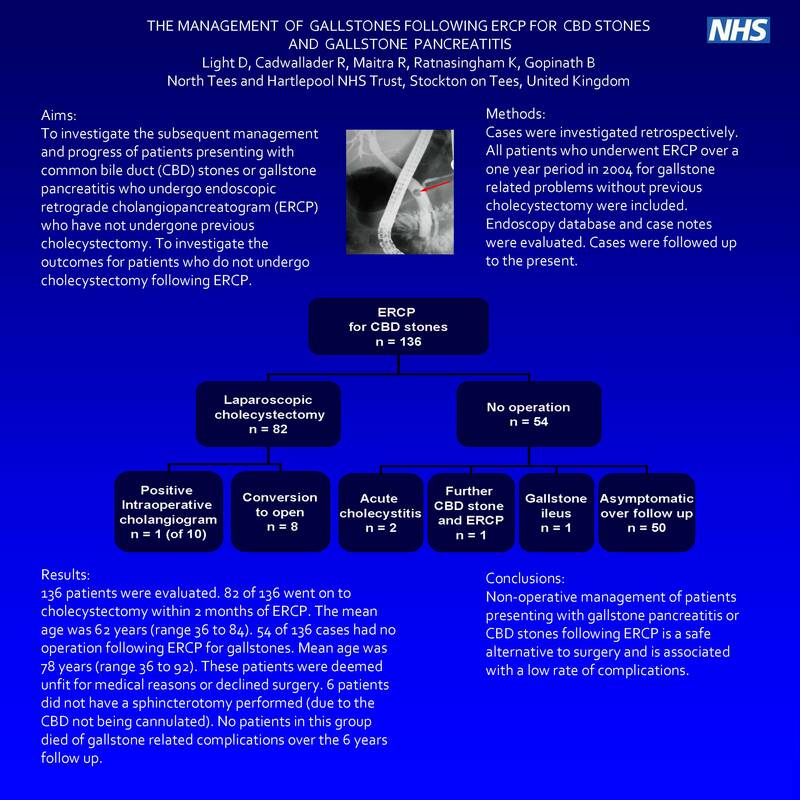 54 of 136 cases had no operation following ERCP for gallstones. Mean age was 78 years (range 36 to 92). These patients were deemed unfit for medical reasons or declined surgery. 6 patients did not have a sphincterotomy performed (due to the CBD not being cannulated). 4 patients re-presented over the follow up period (2 patients had a single episode of cholecystitis with no further presentations, 1 gallstone ileus which required laparotomy and 1 patient who had a further CBD stone which required another ERCP 2 years later). All of these patients had a sphincterotomy performed at ERCP. No patients in this group died of gallstone related complications over the 6 years follow up. Non-operative management of patients presenting with gallstone pancreatitis or CBD stones following ERCP is a safe alternative to surgery and is associated with a low rate of complications.